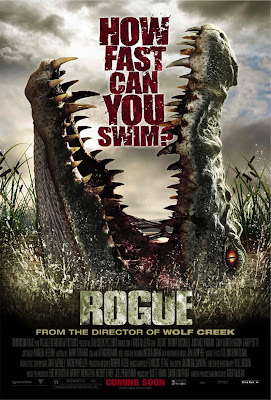 Rogue is a the greatest and most silent Creature-Croc Movie to date! Thanks to this film for saving a handful of disappointing Creature and crocodile-inspired films. Actually, ROGUE is way better PRIMEVAL and LAKE PLACID. What this movie possesses is a stylish direction and a plot that may look like cliche but its well-written and implemented. The movie ROGUE is about a handful of tourists having a boat tour in the Australian Outback. As they were about to go home, their attention was caught with a signal flare from a distance. The tour guide ( Kate played by Radha Mitchell) decided to look after a supposed to be distress signal. When they arrived at the what-they-call a Sacred Place. Suddenly, a 25-foot crocodile bumped on their boat. Luckily, they were able to go on a small island found within the lake before the water gets into the boat. The dilemma is now on how to escape the fierce of the huge crocodile who is just waiting and lurking around the lake...waiting for its human flesh meal. ROGUE is a satisfying thriller and suspense without much gore and violence. The horror and the tension in the whole film is very dominated by a stylish plot that gave emphasis on the struggle and the emotions of every characters who wanted to live and survive. This is a film geared in the idea of suspense and selective thrills without showing much of the EATING SCENES. I just love how the Director combined the elements of surprise, horror, hope, disappointments, mild gore and suspense all in one PACKAGE. The film is a slick flick of survival that effectively delivered much of its emotional aspects to the viewers. The pacing of the story was progressive and not boring. I also love the Australian Outback Setting of the place. The film showcased the luscious Aussie forests down to the creepy rivers and lakes. Which is by far, one of the best setting of any crocodile film. The characters were also great. Even though majority of the castings weren't A-LIST Hollywood Celebrities at all, but they delivered well in this film. The film's editing is also commendable. Its sharp and realistic. Its inventive and visually-appealing. I love the night scenes of the film. Rogue is a perfect ride of enough scare, thrill, chill, suspense and a mixture of whole some gore minus overrated violence and idiocy. So far, this is the BEST CROC-INSPIRED Film to date!